I’m a Sausage Fiend, Don’t You Know?! When I moved house a couple of years ago, I didn’t just leave a little love nest behind, I left my local butcher behind too. He used to do the best pork and leek sausages of all time, in the world, ever, etc. While I found quite a decent butcher’s nearby, I was quite underwhelmed by their sausages. I took that as a challenge, bought my own mincer and have never looked back. If you don’t mind handling slippery meat, I thoroughly recommend you doing the same. I’ve been doing them for a while now and have only ever had one ‘alright’ one. The rest have been immense, which I admit sounds a bit cocky but there’s nothing quite like pulling out your own sausage when people come round to eat. It impresses people no end for some reason. The feedback has been excellent so I’ve continued to do them, especially as they are so easy to do, even if they are a little labour intensive. 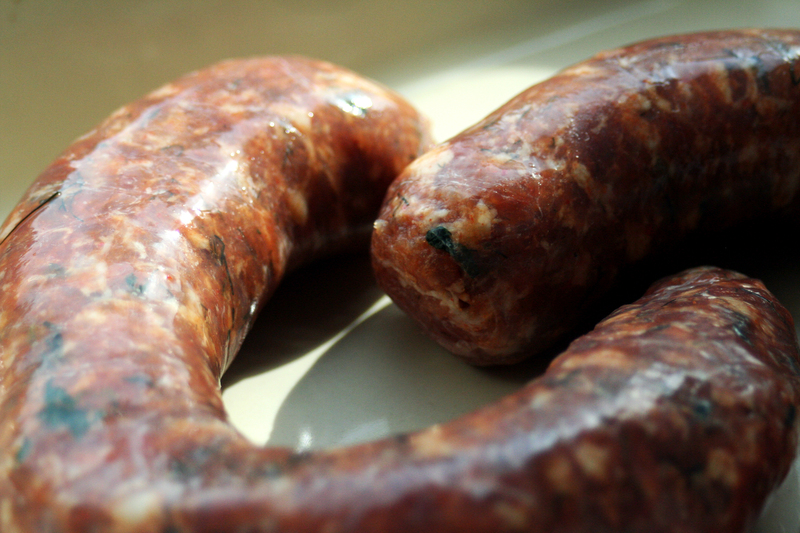 One of my fallback sausages is the Italian Spice sausage and here are two such sausages looking very happy together! One of them is now sitting, even more happily, in my stomach. Somebody thank that pig! I once enjoyed a Westmalle Dubbel with a spicy sausage in Bruges but alas, the two have never been seen in the house at the same time. *This is a lie actually. I just can’t remember them all off the top of my head!